Here in Philadelphia we are already in the swing of the holiday season but, if you're like me, you waited until it was time for the 12 nights of Christmas to decorate your tree. As an Interior Designer, the aesthetics of the tree are important to me and I look to create that Christmas feeling of nostalgia and a little touch of whimsy. Elaborately adorned Christmas trees are often the focal point of homes during the holiday season, and decorating the tree is a family tradition for many. From the Christmas tree skirt all the way to the topper, make sure your Christmas tree is one of the best this season by learning a few designer tips on how to achieve a more lush, dramatic Christmas tree. The secret happens to be in the layers. Once you’ve chosen the perfect Christmas tree the fun can begin! The sparkle and shine of the tree comes primarily from the lights you put on your tree. Faceted glass bulbs will refract more light and appear brighter. Small twinkle lights also have impact when you layer several strands and pair them with ornaments having reflective surfaces. To illuminate the tree from the inside out, string lights around the trunk and the branches. Starting at the base of the trunk and working up, wrap the lights around every major branch, moving from the trunk to the tip and back. Definitely don’t skimp on lights! A good rule of thumb is, for every vertical foot of tree, use a strand of 100 lights. There are no firm rules when draping garlands on a tree as long as you don’t create the sausage effect, with branches bulging between tightly – cinched garlands). Start at the top, stringing less garland, and work your way down, increasing the amount of garland. 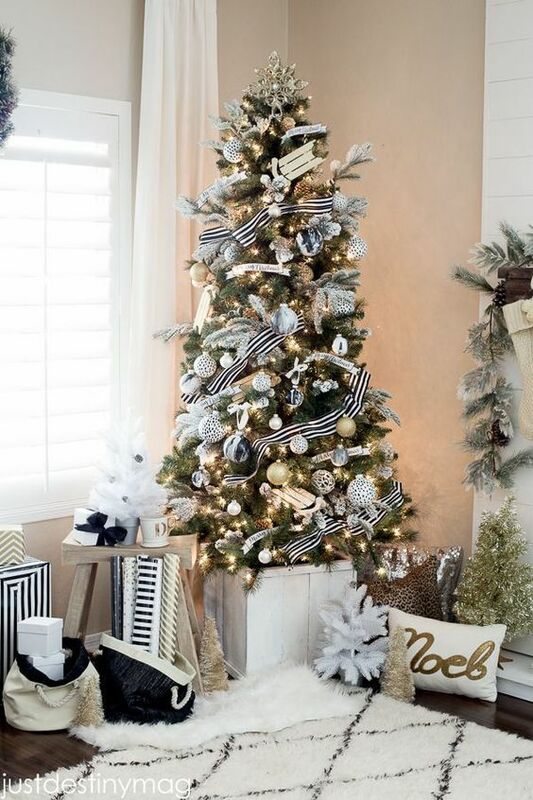 Thick ribbons or foil garlands look best wrapped loosely around the entire tree. The trick is to avoid the busy look, for every vertical foot, use about two strands at most. To showcase your ornaments, start with the most important ones, the ones that have special significance to you and your family. Then hang the largest ornaments, spacing them evenly apart. Fill in around them with medium and small sizes, balancing the overall look. Finish with specialty shapes. For interesting variety, include all shapes. Create depth by hanging some ornaments closer to the trunk. 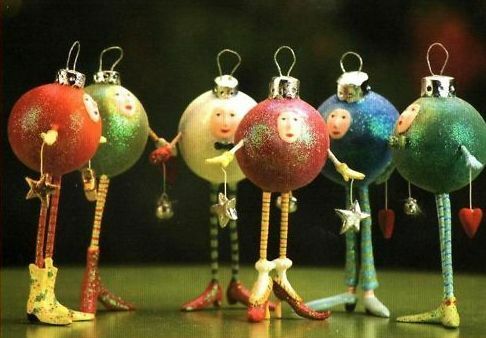 My favorite ornaments are from the Krinkles collection by Patience Brewster. 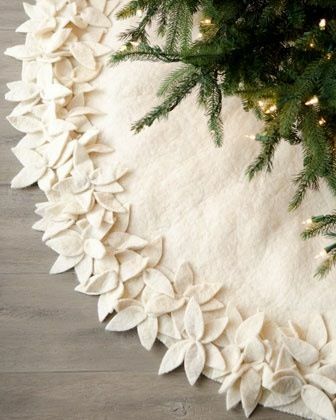 The tree skirt is the finishing touch to your designer tree. It helps you to hide the base of the tree in a fashionable way. It also creates the backdrop for special packages from Santa. Last but not least, The Tree Topper. 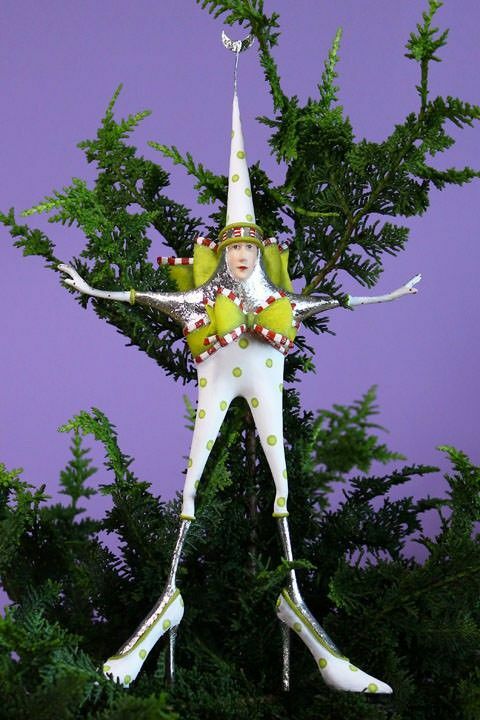 The Tree topper is the true finishing touch to your tree. Whether it's a family heirloom or just something special that speaks to you, adorn your tree with that special piece. Throw Back with my sister Denise.